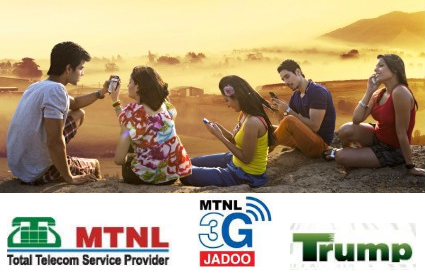 India’s first 3G Mobile and Data service provider Mahanagar telephone Nigam Ltd (MTNL) is all set to launch FREE Roaming Service between Mumbai and Delhi for its postpaid and prepaid mobile customers from this republic day i.e. 26 January, 2014. According to our exclusive sources, India’s telecom minister Kapil Sibal will announce this FREE Roaming Services for MTNL customers between Mumbai and Delhi on 24th January, 2014 and the service will be available for customers starting from 26th January, 2014. With this launch of Free Roaming services between Mumbai and Delhi, MTNL customers can enjoy FREE Unlimited incoming calls while roaming in own circles (Mumbai/Delhi) without any recharge or STV all outgoing calls will be charged at customers existing plan. Mahanagar Telephone Nigam Limited (MTNL) is a state-owned telecommunications service provider in the metro cities of Mumbai and New Delhi in India. custumer care wale kahte hai BSNL ki duplicate sim FREE hai bas 100rs ka bsnl office se top up karwana padega, Lekin BSNL office Etawha Up. wale sim ki cost 100rs lete hai aur top up bhi nahi karte hai. Complaint karne par kahte hai hame uper se aadesh nahi hai..
Don’t use hindi words here. This is a English forum. Stop hindi here. HINDI HAI HUM WATAN HAI HINDOSTAN HAMARA….